This Sailfish center console is one of the best riding fishing boats you will ever experience. 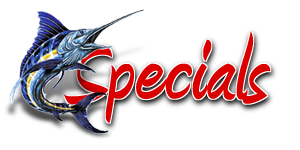 The Sailfish is a quality boat with full color electronics, outriggers, livewell, saltwater washdown and much more. We are very excited to have this boat in our rental fleet and to be able to offer the Sailfish to our customers; you will not be disappointed with the Sailfish performance!